I think the best way to start this off is to say that becoming a member of this Mars Rover team was probably the best decision I ever made at OSU. This year started my exploration of what are now some of my favorite hobbies as well as where I started to make some of my best friends. I’ve learned more being a part of the Rover team, and the OSU Robotics Club, than I could have ever imagined when I started on the team as a lowly electrical team grunt worker. For some background, I think I need to introduce the University Rover Challenge. 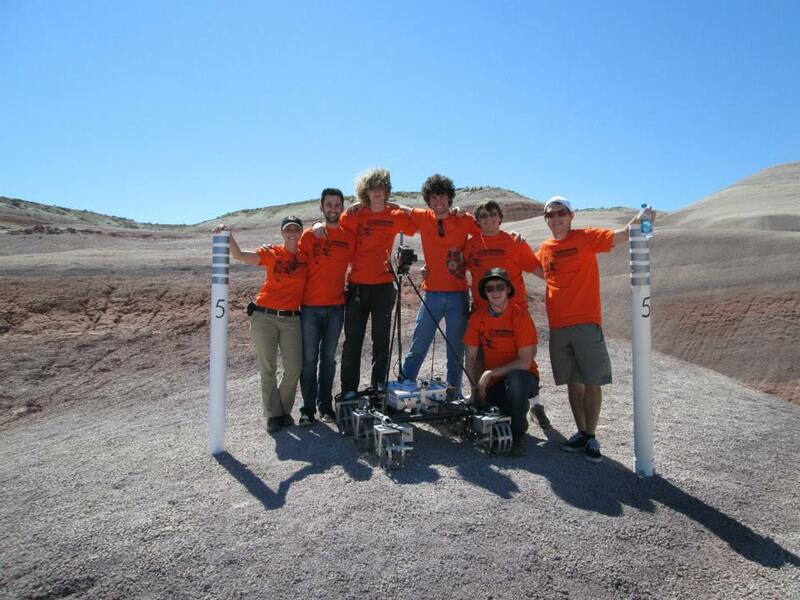 This competition takes place in Hanksville, Utah at the Mars Desert Research Station. Teams from all around the world come together to determine who has the most capable rover. Tasks include equipment servicing, astronaut assistance, extreme terrain, and science tasks. An autonomous task was added starting the 2016-2017 competition year. For all but the autonamous tasks, rovers are expected to be remotely operated either from the mock mars Hab or from the back of a u-haul truck where the operators cannot see their robot. Events are timed and change slightly from year to year but are generally pretty straightforward. The equipment servicing task requires that you use a robot arm to manipulate some control panel or computer or maybe change regulators on gas tanks. Astronaut assistance generally involves bringing gear to an astronaut, such as a tool chest or water bottle. Extreme terrain tests the robustness of your team’s rover on massive boulder fields, steep hills, large cliffs, and overall difficult environmental obstacles. The science tasks requires that your team retrieve sterile soil samples, high-resolution images, and any other data which could help you prove that there could have been life on “Mars”. In the more recent years as autonomy has been added. Rovers now have to navigate to GPS waypoints while avoiding obstacles until ultimately finding a tennis ball near the final waypoint and driving to it complete the challenge. So this first year, I had just finished my freshman year of OSU and was very much a beginner when it came to programming and advance PCB assembly, so of course that’s what the electrical team had me start on while I was there. After a crash course in surface-mount PCB assembly I began assembling boards for the team, mostly motor controller PCBs if I remember correctly. Once the boards were assembled, I then flashed them with the firmware that had already been written, and made some minimal changes to that code it it was necessary. I remember being incredibly intimidated being given what I felt were advanced tasks as someone with no experience, but on the Mars Rover team they didn’t have the time or man-power to not give out such tasks. These were people volunteering their time after all. As the year progressed, I got better and better at soldering and eventually started helping with other electrical tasks like loading custom firmware onto the point and shoot camera needed for the science tasks and figuring out how to electrically interface to the main computer, which was a beaglebone white with a custom designed PCB hat. Once competition approached, I was asked to come along for the actual event and I happily agreed. These competition days are probably something I’ll never forget. For nearly the whole week I pulled all-nighters fixing and programming boards, replacing failed crimps and housings, and staying up to help the software/team lead John Zeller debug his ground station code. I probably slept 15 hours the whole 5 days we were there, and drank more caffeine than I care to admit, but it truly started a project addiction. Never had I done something so complicated but also so fun!